September 13, 2018 10:24 am. Trainer Richard Gibson paid tribute to Hong Kong Jockey Club consultant Nick Columb after Right Honourable anchored a double for both his handler and jockey Zac Purton with victory in the Class 4 Sheung Tak Handicap (1650m) at Happy Valley tonight (Wednesday, 12 September). “My first thoughts after this horse passed the post tonight were for Nick,” Gibson said. “This horse is not a particularly big horse, barely 1000 pounds, so first-up we always knew he’d be strong tonight,” Gibson said. Reigning champion rider Purton brought up his second win of the night aboard the Chris So-trained Eighty Eighty (121lb), victorious in the Class 3 Shun Lee Handicap (1200m). For So, who has prepared six second placegetters from the first 36 races this season, the win was a welcome change of luck. “I normally cheer my horses home very loudly, but I stayed completely silent for this race, so maybe that’s what I need to change,” said a relieved So with a laugh. “No, the horses have been running well and I know that if they keep running well the wins will come. As for Gibson, the trainer – celebrating his 49th birthday today – also tasted success with German import Faithful Trinity (114lb), who scored his first Hong Kong triumph in the Class 3 Oi Man Handicap (1650m). 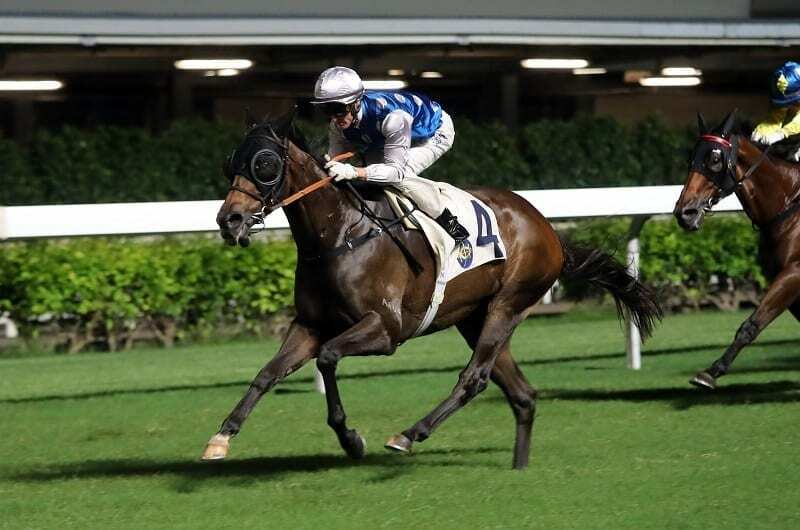 The Wiener Walzer four-year-old, who won the Group 2 Gran Criterium (1500m) in Italy as a juvenile, had shown promise at the end of last season and the trainer believes that he can continue to progress in his third Hong Kong term. “Faithful Trinity was always going to be nailed on for an 1800m race early in the season, especially at Happy Valley,” he said of the Matthew Chadwick-ridden galloper. Trainer Tony Cruz says that Class 2 Wah Fu Handicap (1650m) winner Circuit Glory (119lb) is capable of finding the form that saw him win the Group 2 Championship Stakes (2100m) in New Zealand pre-import, but that he needs a serious attitude adjustment in order to reach those heights. “I’ve watched him for a while and he’s got a lot of bad habits, he showed them again tonight,” Cruz said. “But he’s always been an impressive horse, he won five of seven in New Zealand, and I think that if he can just be a bit better with his manners, he can win a few races this season. The night’s feature, the Class 3 Community Chest Cup Handicap (1000m), was taken by the Ricky Yiu-trained Keep Moving (123lb), who appreciated the 10-pound claim of apprentice Victor Wong. “Not many horses can win five from 10 in Hong Kong though. The Happy Valley 1000m is perfect for him with tempo and pace, so I will look for another one now he will be in Class 2. Yiu also prepared a double with Mickey Rich (128lb) taking the first section of the Class 4 Hing Man Handicap (1200m). The Sepoy four-year-old provided jockey Neil Callan with his first win of the term. Also scoring a first win for the season was trainer David Ferraris, with Ambitious Heart (126lb) racing clear for a strong on-speed win in the Hing Man Handicap’s second section under Alberto Sanna.